Morphie is an accessories company best known for the mophie juice pack that adds extra battery life to an Apple iPhone or a Samsung Galaxy S III with a cell embedded inside a rugged case. Now, the company has another cool product that right now is available for the Apple iPhone 4 and Apple iPhone 4S. The mophie OutRide combines a tough lightweight polycarbonate case and a mount to allow you to turn your handset into a sports camera. 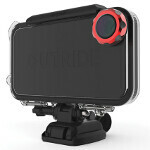 You can mount the morphie OutRide on just about anything to capture POV video. And the case is waterproof and rugged enough to protect the phone in just about any situation. Priced at $149.95, the mophie OutRide has two interchangeable backs, one for dry land and the other for shooting near water. The former lets you use all of the features of the touchscreen while the latter protects the device underwater up to 5 meters. The wide angle lens gives you a 170 degree viewing angle, and the OutRide is available in white with a silver aluminum bezel from Apple, or in black with a red aluminum bezel from morphie. 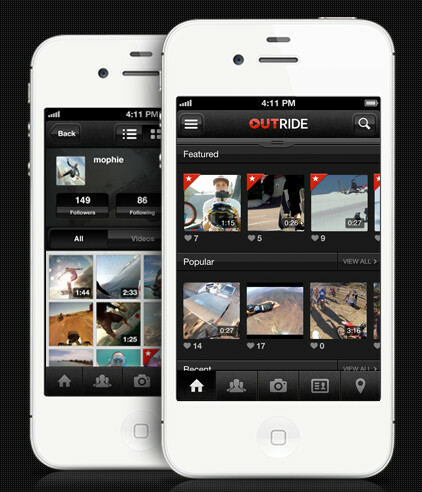 There is an OutRide app from the Apple App Store that goes with the mophie OutRide, allowing you to take your videos and share them by uploading directly from your Apple iPhone 4 or Apple iPhone 4S. You can record in 720p at 60 fps or in 1080p at 30 fps in either portrait or landscape, edit, and then share them via email, text, YouTube or other social networks. The mophie OutRide allows you to record from a unique perspective, and the protection that the case provides is the key to this accessory. If you're interested in the product, you can click on the sourcelink. A camera that good doesnt need much, but thats a sweet app. Looks like a very "comfortable" sports cam... Maybe next time they will make case for an iPad... Would be nice to see iPad on the helmet maybe it would work like a spoiler?! hahaha you sir made my day! Ummm. I think the company name is Mophie. thats why i like Iphone a lot. Yet another accessory to make the iNcomplete camera complete; put it togethet with Will-i-Am's little access-iToy and the iPhone's camera is almost as good as the one on the Galaxy Note II or the GSIII. That guy simply wants to hate on apple, the camera has always been one of iphones strongest selling points. Even the most hardened droiders acknowledge iphones camera as a strong point. This guy needs his vision checked. Go open your presents dude, and lets hooe one is a pair of glasses. I just opened everything, no darn glasses! I got some Duct Tape, though, but what aM i supposed to do with that ;-? That's just really mean and unnecessary, I'm going to tell my iDaddy to beat you up with his 4" iPhone!! "...the camera has always been one of iphones strongest selling points." Exactly! WAS but not anymore! I own the Galaxy SIII, it have a pretty good camera however I would love my phone to have half of the accessories that Iphone have~ Im not an apple fan whatsoever but It does have a better camera than my phone! That only happens when someone with a Nexus 4 stands too close to someone with iPhone 5; it's called the Purple Glare effect and it's only a byproduct of iPhone 5.
whats wrong cant you accept something you slated the iphone for is found on one of your precious android devices your a tragic fanboy, and where are those who keep going at me and wp8,bb and ios users? why arent they saying anything to an android fanboy..ohh thats right because there just as bad and believe its ok if its and in favour of android. Dude youre really childlike arent you? Just accept the fact that apple makes good products. Not the best not the worst, but damn good. Restrictive doesnt mean bad, it means restrictive. I don't deny that LG Nexus has Purple Halo problem but in first place my response was to comment in which was talk about Samsung Galaxy S III and iPhone 5 NOT about LG Nexus! And anyway search with Google or search in YouTube and you will find more complaints about iPhone 5 Purple Halo problem than LG Nexus. Also look at iPhone 5 and LG Nexus photos and you will also find out that Purple Halo more frequent case on iPhone 5 than on LG Nexus, seems that iPhone 5 camera is more sensitive and in the same conditions can get Purple Hallo effect more easier than LG Nexus.